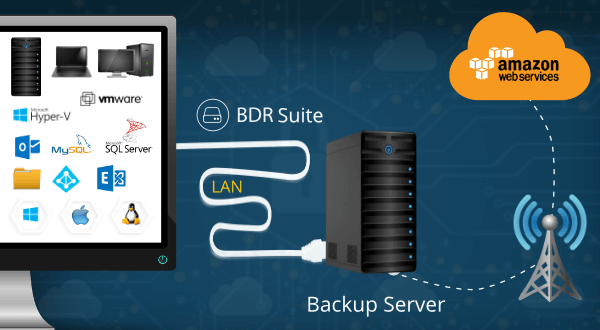 It is difficult for a service provider if their clients data stored in the local backup server gets corrupted or damaged as it tarnishes the reputation of their trusted customer. Vembu offers an additional data protection to the businesses of any kind by allowing the service providers to replicate the backed up data from the local BDR server to the Vembu OffsiteDR server running on a virtual machine created on the Amazon Web Services. With this facility, the service providers can now replicate and safeguard their customer data in Amazon Cloud. If the data in local backup server gets corrupted or the backup server gets crashed, it can be restored with minimalistic downtime. Vembu will provide an AMI of the Virtual Machine bundled with Vembu OffsiteDR to the partner or service provider on request. Using the AMI provided, a new Virtual Machine will be spun off on Amazon Web Services where Vembu OffsiteDR is already installed. The backed up data of the customers from local BDR server will be now replicated to OffsiteDR in the new AWS virtual machine in minutes.